Recently got the bismarck and was very excited for it. Went into a few matches and was utterly disappointed. It doenst brawl as well as gneisenau, despite me playing the same way it is as gneis, aka get in close when i have an opportunity and 1v1 or even 1v2 sometimes (like really close, aka <4km). The gunnery feels ok but the armor is not as good as it seems... even angled richie can rip off 10k dmg with AP and with stock hull the maneuverability is just plain terrible. Does Bismarck really requires a different playstyle than gneis or am i doing something wrong? Bismarck is a great ship and really stands out from others at her Tier for me. She is a brilliant brawler with powerful artillery. Her secondary batter is the best of all Tier 8 battleships. She is quick to respond and can survive anything. I feel like I'm finally starting to get the hang of her. My first 8-10 matches were losses in this boat and I died pretty noobishly. I've found that my best games come from hanging back a bit until other battleships have started drawing fire before I go a little more aggressive and start to advance on the enemy. 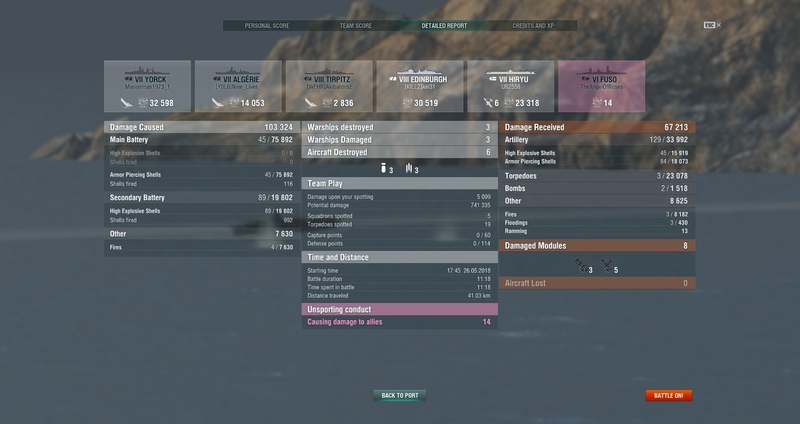 11.3km range on secondaries is nuts (Fires from my secondaries are what killed the Tirptiz in this match.) Between straight damage and fires my secondaries are doing ~15-20k damage every match. Dispersion on the main guns is what you've grown to expect from the Germans but you still shouldn't be afraid to take long range shots at stuff. The guns hit hard when they land. I've had the Bismarck for a while now and I agree that its secondaries while pretty good aren't something I'd, say, solely rely on to kill a nearby cruiser or dd while I focused on something else. 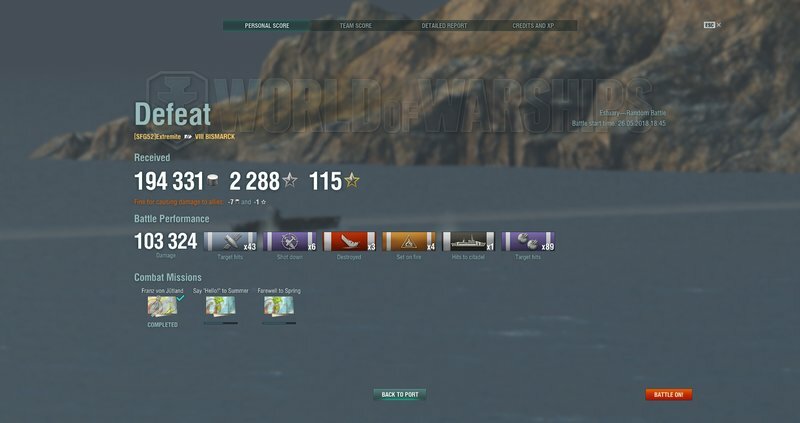 What I've found I CAN count on those secondaries for is (1) to scare off those dd's from feeling like they can just freely torp my flank (2) when I'm brawling at close range dueling with another BB, the fires they'll set make the difference between who lives and dies. On that note, Bismarck's best damage from her main guns are from several Km out; they're less-effective at 1-2km brawling distance (I don't think it's because of the "plunging fire" effect because it seems a little close, but dudes on here with better grasp of the damage modeling of her guns please feel free to correct me. I never try to drag Bismarck into a brawl first-hand. IMHO, brawling is always a last resort, because even if you win, you regularly lose 50% or more of your HP so you can't play as aggressively for the rest of the battle. Strangely I did a semi-sniper build with my Bis - chose the reduced dispersion mod for my mains rather than a total secondary build (so that may explain my experience with the secondaires). But the trade-off is that I have a decent chance at citadeling (or at least getting 6-10K damage per salvo) against high-tier BB's at distance (10-14km) before I'm forced to close with them.